As per UNICEF data, almost half of all child brides worldwide live in South Asia, with 1 in 3 haling from India. 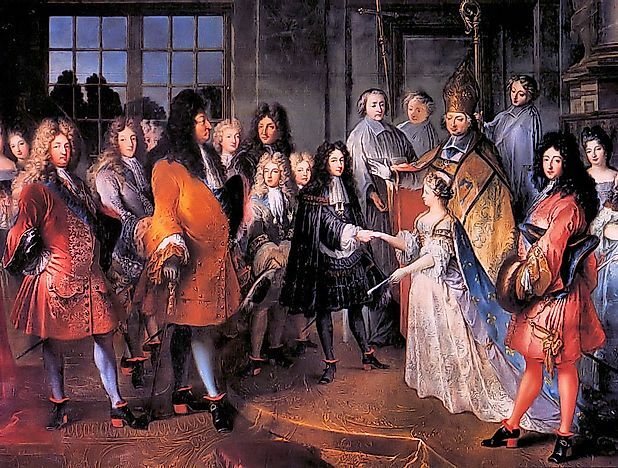 Child marriage in 1697 of Marie Adélaïde of Savoy, age 12 to Louis, heir apparent of France age 15. Child marriage happens across countries and cultures when parents arrange marriages for their children before they are 18. Both boys and girls suffer from this practice although girls are disproportionately submitted to childhood marriage. This act is not a simple matter, factors such as tradition, gender inequality, and poverty come into play. As per traditions, child marriage is something that has happened over generations, and nobody questions its existence. For many, the act transitions girls into their community roles as mothers. Other times, poverty is the driving force behind planning a child’s marriage as it allows a family to reduce their household expenses. Sometimes it is a means of settling a debt or income for the family; many parents receive a bride price for their young daughter’s hand in marriage. Gender inequality is at the root of the decision to marry off young girls. Parents are more likely to view girls as burdens and getting them out of the house allows them to use their remaining savings freely on male children. Child marriage is a global issue and found on nearly every continent though some places have a higher prevalence than others. This article takes a look at which regions of the world have the highest participation rates in child marriage. Estimates indicate that roughly 700 million women alive today were married before the age of 18. Of these women, 33% were married before they were 15. South Asia reports the highest prevalence of child marriage in the world. Here, 56% of women between the ages of 20 and 49 were married before turning 18. Countries within this region that are big contributors to young girls marrying include Bangladesh (52%), India (47%), Nepal (37%), and Afghanistan (33%). The major influential factor in South Asia is the belief that women should become mothers and wives rather than focusing on education or careers. Girls who live in poverty are more likely to be forced into this practice as well. These countries still practice paying a dowry (a price the bride’s family pays to the husband’s family) and dowries are lower when the girl is younger. West and Central African nations are the next most likely to participate in child marriage. Almost half, 46%, of all married women between the ages of 20 and 49 were married before 18 years of age. Niger has an astounding rate of 76%. Throughout Africa, the practice of marrying young girls is commonplace and rooted in poverty. In fact, the region of Eastern and Southern Africa reports that 38% of married women were married during childhood. Many families believe that marrying their young daughters is an opportunity to protect them from abuse and unwanted sexual advances. This practice is traditional in a region where going against tradition is taboo. Ridding the family of the responsibility of caring for young daughters also allows them to focus their resources on educating their sons. On the other side of the world, 30% of married women in Latin America and the Caribbean were married before turning 18 years old. Given that this is such a large region, the practice varies widely from place to place. In Nicaragua, the rate rises as high as 41%, 37% in the Dominican Republic, and 36% in Brazil. Girls who end up in childhood marriages are generally from poor, rural areas and typically come from more indigenous families. Due to influence from the Catholic church, out of wedlock pregnancies are stigmatized and force girls into unwanted marriages at young ages. This region is the only one in the world where the rates of child marriage are not declining. The Middle East and North Africa has a 24% rate of women who entered marriage during childhood. In some countries, the rate is very low like in Algeria (3%). Yemen, however, has a rate of 32%. Gender inequality is a driving force for child marriage in this region; girls are not provided with equal educational opportunities. Many families live in absolute poverty, leaving them to believe that marrying their young daughters is the only option out. In areas with political instability, this practice often increases which is the case here as well, particularly in Syria. The uncertainty of the future leads many parents to believe their daughter will be protected if married. Syrian refugee camps in Jordan have a 30% child marriage rate with women. Despite its hardships, this region has, however, made the most significant progress in reducing the practice of child marriage. With a 21% rate, the region of East Asia and the Pacific is next on the list. In places like Vietnam, the prevalence drops to 11%. The influential factors here are similar to the other regions listed. Rampant poverty, generations-long tradition, and unequal status for women and girls all come into play. This region is also prone to natural disasters resulting in instability which increases the prevalence of child marriage. The same is true for Central and Eastern Europe where the rate of this practice is at 14%. Percentages vary widely across the region, from 12% in Moldova to 3% in Serbia. Girls who have been subjected to marriage before turning 18 years old are less likely to finish school thus contributing to the very cycle of poverty that their parents were trying to escape by marrying them off at a young age. Research also shows that these girls are more likely to suffer from domestic violence as a result of the same gender inequalities that pushed them into child marriage. In addition, young married girls quickly become young, adolescent mothers who are more likely to die during childbirth and their babies are less likely to survive their first year of life. Empowering women and families, educating them about the negative consequences of child marriage and improving household economic conditions are all necessary if this practice is to cease in the future.